Jagged streaks of lightning pierced the darkening sky as we reeled in our fishing lines this morning. Al turned the key and put the boat in gear. Al, Gary, and I were out in the sound, near Shell Castle Island, along with a few other boats. We had barely gotten under way when I looked back to see the others following behind us. Luckily, the storm wasn't moving particularly fast, and we easily made it back before the thunder rumbled uncomfortably close. I've never been much of a fisherman (strange isn't it, living here in a fisherman's paradise), but I'm hoping to make it more a part of my "retired" life (after all, a life-time coastal fishing license for anyone over 65 is only $15.00!). Oh yeah, I hooked a small flounder, but he wiggled free just as I pulled him to the boat. Our latest Ocracoke Newsletter is a small photo album with historic pictures, including the aftermath of the 1944 hurricane, the 1921 Ghost Ship of the Outer Banks, the 1935 wreck of the Nomis, the Island Inn, the Methodist Church, and the Wahab Village Hotel. I've added a short paragraph under each photo to help put them in historical perspective. You can see the pictures by clicking here: http://www.villagecraftsmen.com/news082609.htm. Deepwater Theater was packed last night as Martin Garrish, Clifton Garrish, Aaron Caswell, and Lou Castro entertained islanders and visitors with a musical tribute to Roy Parsons. Roy...native islander, guitar player, model boat builder, rhymer, jokester, & yodeler...died in September of 2007. He was definitely one of a kind. I can still see his impish smile, his sparkling blue eyes, and his frail frame as, in my mind, he pedals his bicycle past the Community Store, strums his guitar at the Wednesday night Opry, or puts the finishing touches on one of his model sailing ships. Tropical Storm Danny is now a Tropical Depression, having been mostly absorbed by a low pressure system over North Carolina. We got a little rain last night (along with some thunder and lightning), but the system is now moving rapidly to the northeast. We are looking forward to clearing skies and a pleasant weekend. Ocracoke Island's third annual OcraFolk School is only two months away (October 25-30). Scheduled classes include Island Photography, Exploring Songwriting, Island Cooking, Ocracoke Sampler, Visions in Clay (pottery making), and Building Ships in Bottles. To learn more, please go to http://www.ocrafolkschool.org/. There are still a few openings in selected classes. A brand new class is being offered this year, Building Ships in Bottles, taught by Jim Goodwin, who makes ships in bottles for Village Craftsmen. Click on the photo below to see more of his creations. 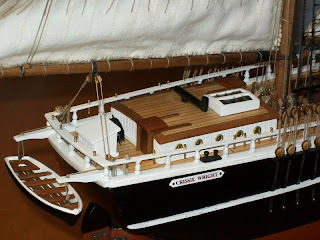 Jim has also just completed a 28" model of the three masted schooner, Crissie Wright, that ran aground near Cape Lookout in January of 1886 during a terrible storm. Unable to reach the stranded vessel, helpless Outer Bankers watched from shore as temperatures dipped below freezing and huge waves swept the captain and several other crewmen overboard. When rescuers finally boarded the Crissie Wright the next morning they discovered four men in the rigging, wrapped in sail cloth. Three were frozen to death. Only the cook survived. To this day residents of Beaufort and nearby villages can still be heard to say, "it's as cold as the night the Crissie Wright came ashore." 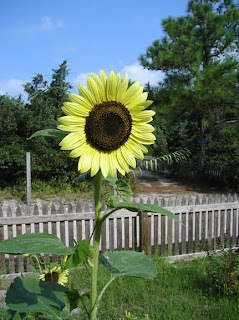 Yesterday I uploaded another monthly Ocracoke Newsletter. It is a small assortment of old photographs that were in my cousin Blanche's collection. There are photos of the aftermath of the 1944 hurricane, an old post card showing the wreck of the Ghost Ship of the Outer Banks, a snapshot of the schooner Nomis hard aground offshore in 1935, a view of the center section of the Island Inn shortly after WWII, a photo of the Methodist Church soon after it was built, and two photos of the Wahab Village Hotel (now Blackbeard's Lodge). I've added a short paragraph under each photo to help put them in historical perspective. I hope you enjoy the pictures. You can see them by clicking here: http://www.villagecraftsmen.com/news082609.htm. Jim Goodwin, who makes our wonderful "ships in bottles" (see http://www.villagecraftsmen.com/goodwin1.htm), will have his creations featured in the upcoming motion picture, "The Lovely Bones," based on the novel by Alice Sebold. You can see Jim's ships as well as one of his big models behind Mark Walberg. Jim says, "Look for the 'Mercury' with the Ocracoke Lighthouse." 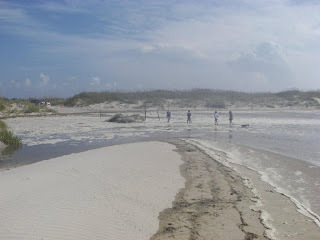 This month's Ocracoke Newsletter is Lou Ann's story about volunteering for turtle patrol with the National Park Service. You can read her story and see her pictures here: http://www.villagecraftsmen.com/news072809.htm. How wrong I was. 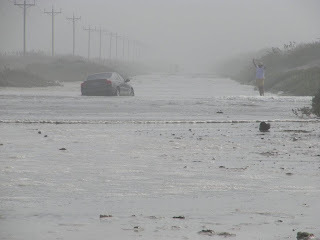 On Saturday I reported that there was some overwash on Highway 12, but that it had virtually no effect on Ocracoke. 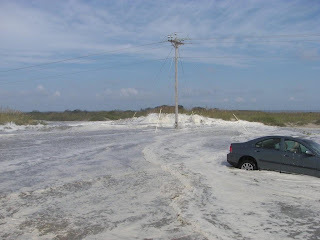 Just yesterday I learned that the overwash was significant (though the road crew quickly repaired the damage to the dunes and re-opened the road). 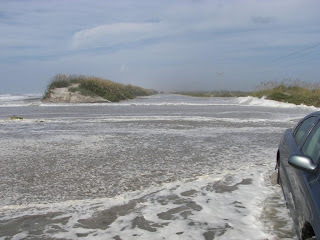 Dale was down at the north end on Saturday at high tide and took these photos. I think they speak for themselves. They are in no particular order, and you can click on them to view a larger image. Thank you Dale! Visitors to Ocracoke occasionally remark on the surname Wahab, an early island family name. James Wahab appears to be the first of this family to live in coastal North Carolina. He received two land grants on Hatteras Banks in 1755. In 1825 Eliza Bradley Howard (1808- 1870) married Job Wahab (1802-1860). Together they had fifteen children. Many of them and their descendants are buried in the large George Howard cemetery (sometimes referred to as the Howard-Wahab cemetery) on British Cemetery Road. Back in the mid 1970s I met Jim Zogby who was visiting the island with his family. Jim, the son of Lebanese immigrants, founded the Arab American Institute in 1985, and was fascinated by stories that the first Wahab on the Outer Banks was a shipwrecked Arab sailor. He made it a point to visit Myra Wahab (widow of prominent islander Stanley Wahab, and herself a seventh generation Ocracoker with Wahab ancestors). During the conversation Myra mentioned that several academics (from Duke University, I believe) had visited her and tried to explain that Wahab is actually a Scotch-Irish name (sometimes spelled Wauchope, Wauchop, or Waughop). Myra, Jim says, would have none of this, and saw the professors to the door. She explained to Jim that the Ocracoke Wahabs were "Ay-rab and proud of it." Jim laughs as he tells me this was the first and only time he's ever heard the pronunciation "Ay-rab" and the phrase "proud of it" in the same sentence. Sadly, although a number of islanders are direct descendants of the Wahabs, the name is dying out on Ocracoke. Not a single Wahab is listed in our local telephone directory. 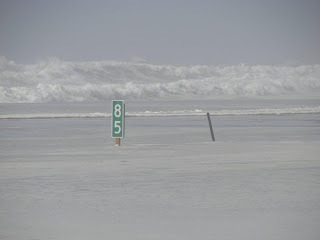 Hurricane Bill (now a category 2 storm) is still several hundred miles east of the Outer Banks, but is producing extremely high tides and rough surf. This morning around high tide the lifeguard walk-over ramp was crowded with locals and visitors checking out conditions at the beach. 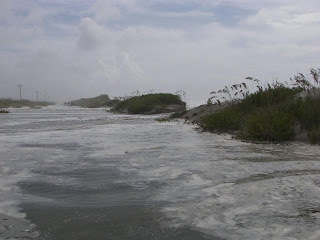 The tide had advanced to the base of the dunes with calf-deep water from there to the berm about where normal high tide reaches. 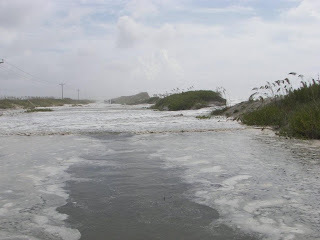 I've heard unofficial reports of overwash on NC Highway 12, and just a few minutes ago a friend called to tell me that a long line of foam has been pushed through the inlet and into the sound. Other than that, Bill has had virtually no effect on Ocracoke. Skies are generally clear or partly cloudy with only the slightest breeze. We all breathed a sigh of relief when it became apparent that Hurricane Bill would track well east of the Outer Banks. 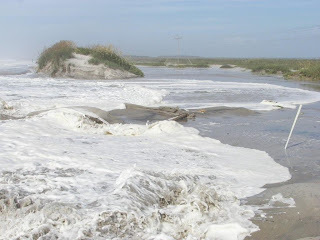 Lately we've learned (to no one's surprise) that Bill will nevertheless be causing unusually high tides and, perhaps, ocean overwash, mainly north of Cape Hatteras. 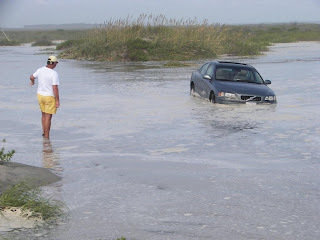 If so, water on the road is most likely Saturday mid-morning and about 9:30 pm, the times of normal high tide. If you are planning to drive down the Banks tomorrow please listen for the latest reports re. NC Highway 12. I bought a porch chair recently, one that needed to be assembled, and I decided to put it together this morning. One small carriage bolt was either manufactured incorrectly, or, more likely I got it cross-threaded. I biked out to the hardware store, but they didn't have the size bolt I needed. While there a neighbor was shopping for potting soil, but he couldn't find the exact product he was looking for either. He chose something similar and jokingly commented about not having a "big box" store close by. Of course, he quickly added that there were many reasons he was happy about that. I thought he might have a tap & die set (so I could re-thread the bolt), but no, he didn't. Just then another islander walked in and the first neighbor immediately asked him about re-threading the bolt. Yes, he had the right equipment, but he was on another errand. Would it be OK if he took the bolt, re-threaded it later today, and brought it back to me when he was finished? Of course, I said. We may not have the advantages of big box stores on Ocracoke, but that slight inconvenience is made up by the neighborliness, good will, and community spirit of our neighbors. And besides, we're only a couple of minutes from one of the best beaches in the country! Yesterday afternoon, as I was sitting on my front porch after lunch, two long-time friends, Jim & Eileen Zogby, stopped by to visit. In the course of the conversation Jim remembered a visit several years ago with me and my verbal sparring partner, Al Scarborough. Apparently Al & I entertained the Zogby family with non-stop humorous and outlandish stories about island people and events (from the distant past up to the present day). Afterwords, Jim said, his children commented that they wished their family had such wonderful stories. After some thought, Jim explained to his children that every family has colorful characters and equally wonderful stories. But the stories need to be passed down (you need to know the stories)...and it helps to have a family member who can tell the stories with flair. In our mobile society sometimes the stories get left behind (Jim's family emigrated to the US from Lebanon). And sometimes the people who know the stories don't know how to share them. Be sure to tell your own stories to your children...frequently. And make it a priority to ask your parents, grandparents, uncles, aunts, and other relatives for their stories. Ask them to describe their childhood home, yard, school, or town. Find out what their parents and grandparents did for a living, when they got their first car, or who their best friend was. Their stories will flow. Almost everyone wants to tell you about himself. You might be surprised what you discover! I took a few days to take Lou Ann back to the Midwest to help her get her classroom ready for school (she could never have done it alone and on time with her broken arm). I always hate to see her leave in August (we have such a great time together), but at least the trip gave us a little more time to spend together. I got back home yesterday afternoon, and immediately Lachlan and David asked me to accompany them to the sound for some swimming (the water is quite a bit warmer in NC than in IN!). In Indiana I had a chance to swim in one of the many lakes in Lou Ann's area. In both places I had a great time swimming and cooling off. Today I'm confronted with wild, unruly grass and weeds in my front yard, laundry to wash, emails to answer, and bills to pay. But I was happy to see that Lou Ann's gardening has reaped some rewards. She planted, watered, and fertilized this summer. The sandy soil in my yard leaves a lot to be desired, but my roses, crepe myrtles, daisies, and snapdragons are beginning to bloom. Oh yes, the sunflowers too! 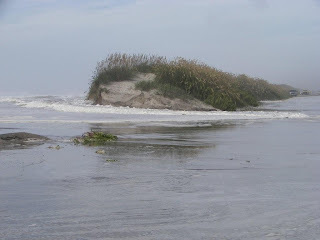 I first came to Ocracoke seven years ago on an invitation by Donald Davis. He thought I would enjoy his storytelling workshop as well as the Island. I decided to take him up on his offer and signed up for the workshop. The first thing I had to do was to find Ocracoke on the map. Most of us mid-westerners travel and vacation to Michigan, Wisconsin, and Minnesota...other cold places! One of my friends suggested I look on a map of Australia. Australia? I am a traveler and a wanderer by nature, but I was not prepared for this pristine beauty of Ocracoke. For three weeks I explored every cove, went to every show by Molasses Creek and let my heart fill with story under Donald's direction. When I returned home to Indiana I carried music and stories of ships and ghosts and lighthouse keepers in my heart. 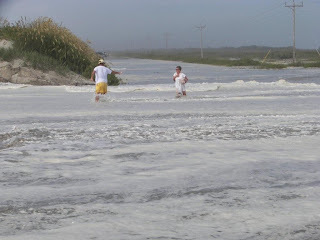 I did not know if I would ever return so I decided to take part of Ocracoke with me back to the heartland. Have pot lucks with your own family, community as often as possible. Have parties to celebrate everything: Robert Burns, the Solstice. Listen to nature while you fall asleep. Spend time with the older folks in your own community. there is beauty wherever you live, take the time to find it. So, meeting Philip is a whole other story, I'll just save that one for later. I love spending my summers on the Island. I feel honored to be part of the community, to tell stories at the lighthouse, spend early mornings on the beach on turtle patrol, and look for haints and ghosts during the evening ghost walks. For now, though, school and storytelling bring me back to the Midwest with farm stands of fresh corn and tomatoes and the early hint of Autumn in the cool night air. You can be well-assured though that my Indiana community is enriched by the Ocracoke community. Thanks for all the birthday wishes and get well notes for the broken arm. I was off the island recently and someone I met used the common expression, Thank God it's Friday. Jim is a long-distance truck driver for FedEx, and he was understandably happy that his work week was coming to an end. I was reminded that only a few Ocracokers have what would be considered a normal work week. Of course there are island school teachers and a few others who have Monday - Friday, 40 hour a week schedules. But there are plenty of fishermen (commercial and charter boat), store keepers, musicians, artists, motel workers, waiters, carpenters, and others who work when they must (including weekends and evenings), with little regard for the day of the week. For all of those folks it will be TGIF (Thank God it's Fall), or TGIW (Thank God it's Winter), or maybe just TGITEOTS (Thank God it's the End of the Season) several months from now. But for now we're all still in the midst of another work season that at least includes opportunities for swimming, fishing, clamming, and time with family & friends. I say TGIO (Thank God it's Ocracoke!). It rained a lot yesterday...torrents of heavy rain, then sprinkles...accompanied by thunder and lightning. But I heard from a neighbor who left early in the morning on the Swan Quarter ferry, before the storms arrived, and when skies were clear. She described the sound in typical island fashion as "slick cam." It must have been a beautiful sight. And then it was made dramatic as scores of dolphins emerged from under water and frolicked around the boat. Apparently a number of pods converged producing a grand display for all of the lucky travelers. On your next trip across Pamlico Sound keep your eyes open. It's not uncommon to see at least a few dolphins. Ocracoke is often described as a small fishing village. One tongue-in-cheek local t-shirt calls Ocracoke "a small drinking village with a fishing problem." In fact, Ocracoke has traditionally been a seafaring village. The earliest settlers were pilots who guided larger vessels through Ocracoke Inlet and across Pamlico Sound, to ports in eastern North Carolina. 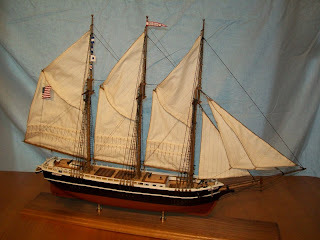 Later, in the nineteenth century, the majority of men made their living as deckhands, captains, and owners of schooners that transported lumber, rum, molasses, and other goods along the eastern seaboard. Fishing was a marginal business. Without ice or motorized boats, fishermen mostly sold their catch locally, or smoked their fish and took them across the sound when conditions allowed. When electricity was introduced to the island in 1938 an ice plant was included. By then many of the island sail skiffs had been converted to gas powered boats. Fishing then became a viable local industry. Today, with the rehabilitation of the island's last fish house and a vibrant Working Watermen's Association, Ocracoke once again is home to a growing number of commercial fishermen. 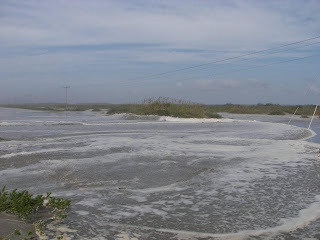 (The OWWA web site is under development, but it does have a great photo you might enjoy: http://www.ocracokewatermen.org/. )Lately I've even noticed several larger eastern North Carolina trawlers docked at the fish house. Be sure to stop by the fish house and purchase some fresh seafood! A few days ago a friend stopped by and commented on the number of shooting stars he saw late at night from the beach. According to him there were 4 - 5 every minute. Ocracoke beach has always been a perfect viewing site for shooting stars. A few years ago several of Amy's friends from Berlin went out to the beach with us. They were amazed at the sparkling display of stars (as you can imagine, not many stars are visible in the night sky in Berlin), and it was the first time they had ever seen a shooting star. Talk of shooting stars reminded me that the Perseid Meteor Shower is almost upon us. On August 12 take a stroll outside after dark and look up into the sky. Before dawn should be good (though the waning moon rises around midnight). I think evening of the 12th would be an even better time to see shooting stars. More information is available on line at http://stardate.org/nightsky/meteors/. Speaking once again about the Ocracoke Island dialect, our visiting linguist, Paula, mentioned a word last weekend that may be unique to Ocracoke. Once, while collecting samples of the island brogue, she heard someone comment that he was "doasted right." This is not a phrase you'll likely hear anywhere else, and you won't find it in any dictionary. 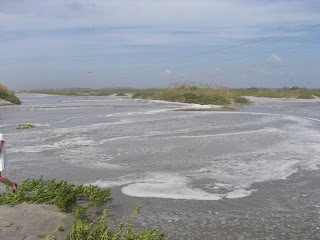 On Ocracoke a bad cold or the flu is commonly referred to a a "dose" (one dictionary definition of dose, of course, is "an amount, especially of something unpleasant, to which one is subjected"). From this, the word on Ocracoke morphed into a verb, so now you hear of people being doasted, meaning they've come down with a bad cold. Paula was fascinated with the word. Termagant is an interesting island word. The word originated in the Middle Ages when it designated a fictitious deity popularly believed to be worshiped by Muslims. The Termagant was a character frequently portrayed in medieval morality plays as a violent, overbearing character in long robes. Eventually the word came to mean a violent, overbearing, quarrelsome, or shrewish woman. 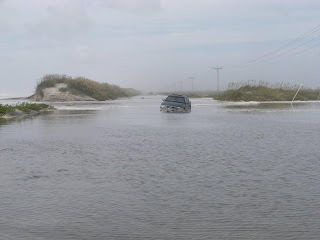 On Ocracoke the word's meaning shifted once again. It designated a mischievous child. It is a word seldom heard on the island today. Maybe some of our local readers will be able to find occasion to reintroduce the word to our community! 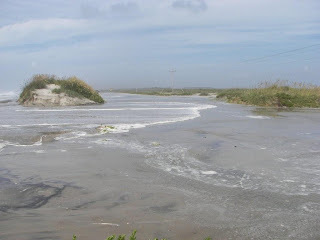 Last weekend Paula Dickerson visited Ocracoke once again. Paula works with Walt Wolfram, linguist from NC State who has been studying the Ocracoke brogue for more than fifteen years. Walt and his staff are hoping to put together another CD of stories told by native islanders. They are looking for more female voices so I put them in touch with Blanche. Paula spent nearly two hours recording Blanche, and she was so happy to meet her and preserve a number of her stories. Paula was amazed at the clarity of the stories, and the wealth of local information (about hunting, gardens, hurricanes, shipwrecks, and other lore) that Blanche shared. Toward the end of the interview Paula asked Blanche about words peculiar to Ocracoke. Among others Blanche offered "termagant." This was a new word for Paula. Look for more about termagant tomorrow. We've published another Village Craftsmen Monthly Newsletter. This month Lou Ann shares her experience this summer accompanying one of the National Park Rangers on turtle patrol. She also took photos. You can read her story and see her pictures here: http://www.villagecraftsmen.com/news072809.htm. Lou Ann (greeting Kati at Books to be Red): "Hi, Kati. See you soon at the pot luck dinner." 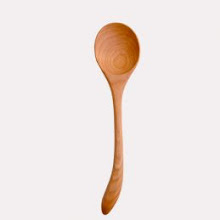 Kati: "What pot luck dinner?" L.A.: "The one for the August birthday celebration." L.A.: "Tonight, at 6 o'clock." Weeks ago Kati and Lou Ann planned this pot luck dinner. Then Lou Ann told Kati she would have to leave the island early, so Kati thought no more about it. Then Lou Ann discovered she would still be here. Kati thought the pot luck had been canceled. Lou Ann still thought it was a go, and told a few people about the dinner. If the two women hadn't run into each other an hour before the scheduled time a dozen or so people would have showed up at John & Kati's (who were planning to enjoy an evening dinner at one of the local restaurants). As it was, a dozen or so people did show up at John & Kati's. John & Kati graciously stayed home to host. It was a small gathering, but the food was wonderful. Many thanks to John & Kati for not stressing out!